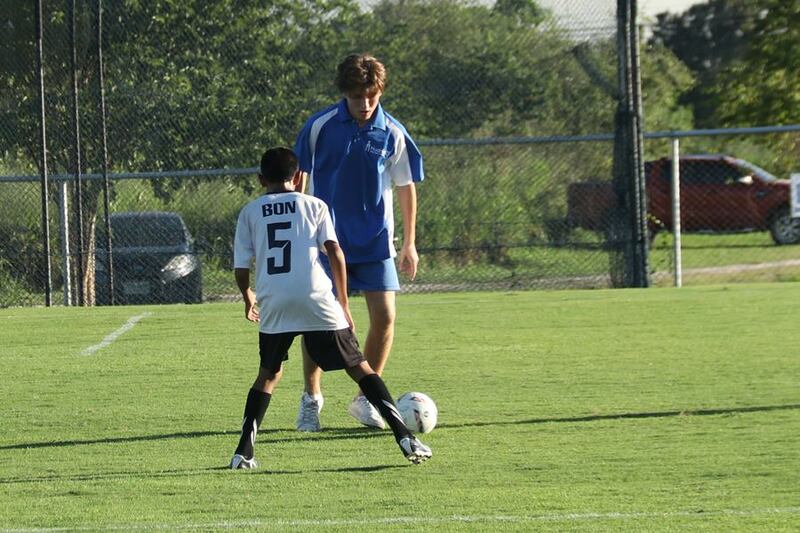 The BMHHFA Under 14 team played their third match this afternoon and their first ever home game. 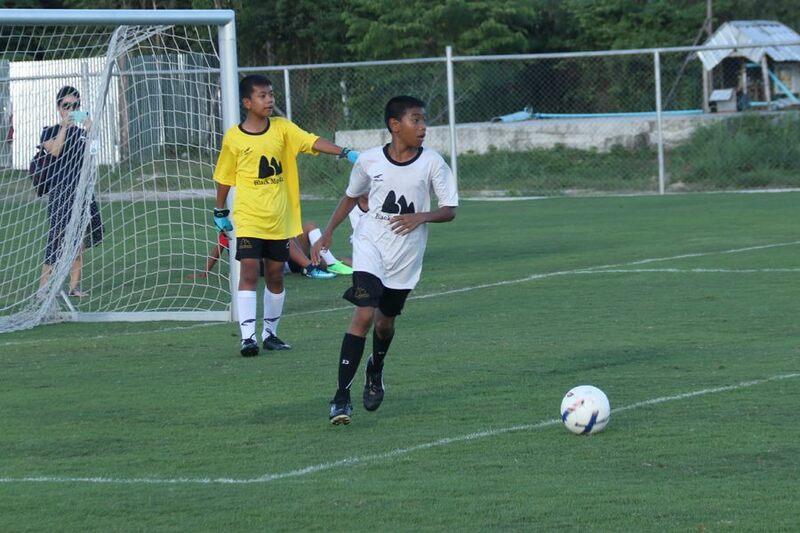 It was a local derby pitching the academy against the Hua Hin International School Under 15 team. The opponents might have been physically intimidating but it didn’t stop the BMHHFA players from trying to pass the ball right from the opening whistle. On a familiar playing surface the team immediately set about controlling the match with a possession based approach. BMHHFA might have been having the lion’s share of possession but HHIS were bigger and stronger and surged into a three goal lead with their more direct approach. Despite being 3-0 down the boys and girls were not disconcerted and continued to pass the ball around, probing for openings. These efforts were finally rewarded with an absolutely outstanding team goal just before half time. Julian piroutted into the box leaving defenders trailing in his wake before putting it on a plate for substitute Shell. At half time the coaches were absolutely delighted with the players, who despite the scoreline had continuously passed the ball with confidence and composure against a much more muscular team. In the second half HHIS made a few changes and BMHHFA finally started to see their passing game reap rewards. 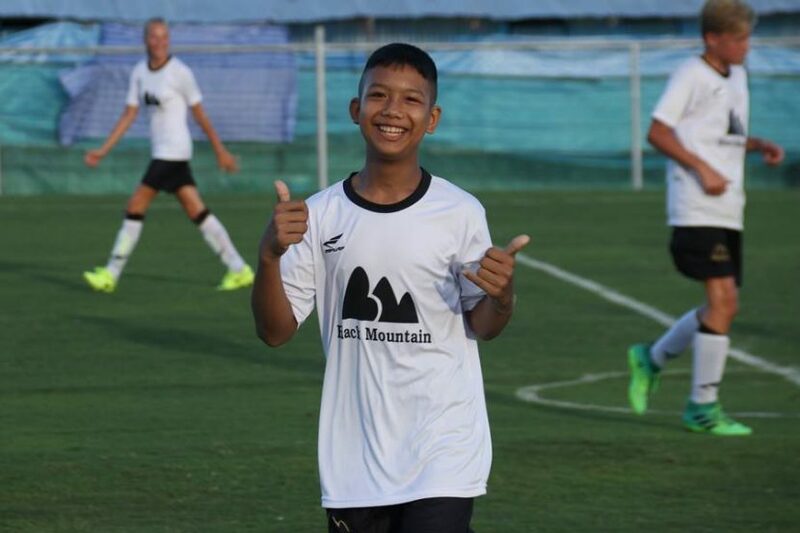 Centre midfielder Julian, who was the best player on the pitch, finished emphatically after some good work from Mean and Freem. After a shaky start to the game Selda was becoming increasingly influential at the back where she linked up very well with Shell (pictured celebrating) and created numerous openings. Her defensive partner, Bon (below), showed incredible composure on the ball and always had a trick to get himself out of trouble when HHIS pressed. BMHHFA’s ability to beat the press was notable throughout. With goalkeeper Wave absolutely immaculate with his distribution, midfielder Julian dropping deep to collect the ball and the two defender’s playing with immense confidence the team was able to shift the ball from defence to attack with consummate ease. This work was rewarded with a well deserved equalizer courtesy of Shell, his second of the match. The winger was promptly substituted to allow Mean to return to his favoured left hand side, from where he would wreak havoc on the HHIS defence. BMHHFA suffered a setback when one of the 15 year olds on the HHIS strode forwards from the kick off and planted an unstoppable drive in the top right hand corner. It was an absolutely superb solo strike and gave the school a 4-3 lead with just a few minutes remaining on the clock. With Pin, who recently turned 12, playing fearlessly up front BMHHFA always carried a goalscoring threat and Mean and Julian both tested the HHIS keeper with rasping efforts that were tipped wide. Julian (below) was at the heart of everything the team did and constantly looking to collect the ball from the goalkeeper or defenders and feed either Pin up front or Freem and Mean on the flanks. On the rare occasions that HHIS did threaten on the counter attack goalkeeper Wave came swiftly off his line to claim the ball. 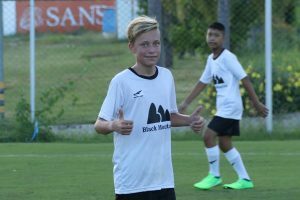 Him and Julian, the two 14 year olds in the team, demonstrated their maturity throughout and provided a reassuring presence in the centre of the field. 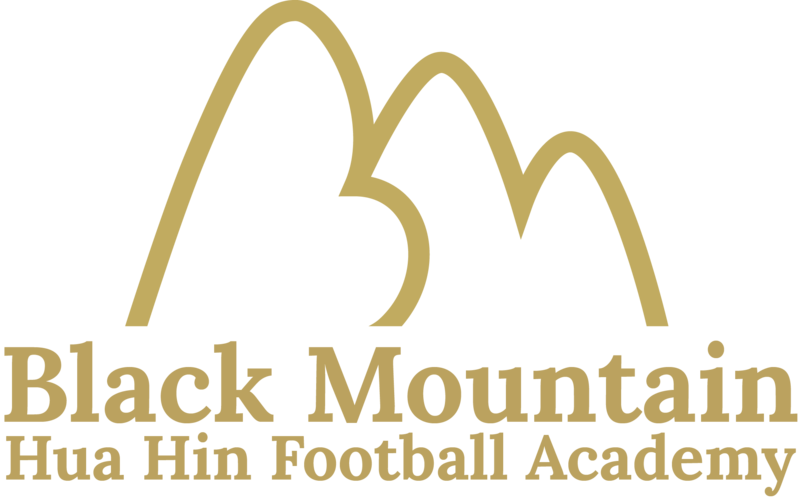 Black Mountain were 4-3 down but with so much possession inside the opposition half an equalizer was on the cards and it was Mean who popped up to provide it. Bon won a header inside his own half and the left winger played a 1-2 with Sprite before burying his shot in the bottom corner. The game finished 4-4 with honours shared. It was an entertaining spectacle and HHIS clearly have some outstanding individual players but BMHHFA played with the type of team work and tempo that can only come from hours and hours of practise on the training field. This was by far the best performance in the short history of BMHHFA and the players and coaches should all be extremely proud. While Wave, Bon and Selda were outstanding at the back with Mean, Freem and Shell all superb on the flanks the man of the match was undoubtedly Julian. The Swedish midfielder took the game by the scruff of the neck and dominated the midfield. He showed great vision and awareness and has become the heartbeat of this exciting young team.